I've had the opportunity to host Holly Bush before and have read and reviewed her books and they are wonderful, wonderful reads. 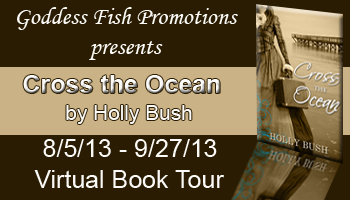 Today, Love Saves the World welcomes back Holly, who is here to promote, Cross the Ocean, her latest book. Holly is giving away a $50 Amazon Gift Card to one randomly chosen commenter. 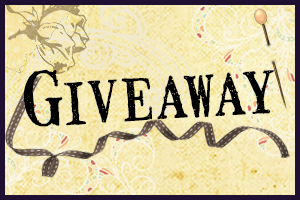 Giveaway is through Rafflecopter. To visit Holly's other stops, click here. 1871 ... Worlds collide when American Suffragette, Gertrude Finch, and titled Brit Blake Sanders meet in an explosive encounter that may forever bind them together. Gertrude Finch escorts a young relative to London and encounters the stuffy Duke of Wexford at his worst. 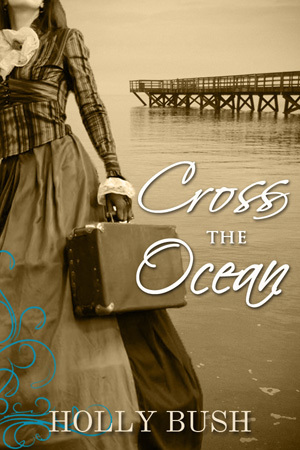 Cross the Ocean is the story of an undesired, yet undeniable attraction that takes Blake and Gertrude across an ocean and into each other’s arms. Blake found his guests in the music room listening to Melinda play the pianoforte. “Miss Finch, may I beg a moment of your time?” he asked as he touched her elbow. The two of them retreated out of hearing distance from the rest. “Yes?” Miss Finch clipped off and folded her hands at her waist. “I find I do owe you an apology,” Blake began. “And every other woman in the room as well,” she replied. “I agree with you there,” Miss Finch said and clapped politely. “Agree with what?” he asked. “Listen to me, Sanders. I meant what I said. I couldn’t care less whether you think I’m attractive or not. You dismiss ideas and brains for the lack of a pretty face. I think you’re a pompous idiot. What do you think of them apples, Your Highness?” she said. Good luck with your tour and thanks for sharing the excerpt, I enjoyed it. What a fabulous novel! I am adding it to my Wish List right now. Congratulations on your successes. I hope the right person wins this. Right person meaning the most deserving. Thank you! Hello all! Thanks for the kind words and I'm glad you enjoyed the excerpt! Good luck in the giveaway! It is a wonderful excerpt thank you. Thank you for dropping by and helping me welcome Holly! Drop by Holly's other stops! Good luck to everyone! Thanks Tin! It's always nice to stop by Love Saves the World! Great review. I would go with amazon. I'd please like the Amazon Gift Card... Thanks for the giveaway. Amazon GC would be great, thanks! I can just imagine the fireworks between a titled gentleman and a suffragette. The blurb and excerpt make the story sound great, and Amazon would be my choice. I'd love an Amazon GC. Id like the Amazon gc. I would love the Amazon GC! Thank you! Amazon GC please. thank you. Would be awesome to win an Amazon g/c, or a prepaid Visa card. Amazon is my top pick definitely. Thanks very much! I'd choose the Amazon gift card! I enjoyed the excerpt! I love Victorian era history and especially the American women's suffragette movement! Thank you! I like the smartalecky repartee! I prefer Amazon; thanks for the giveaway! I'd love the amazon card.